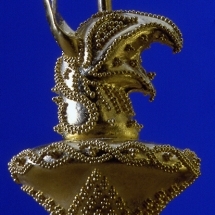 The goal of the workshop is to teach the basic skills of ancient joining techniques and the strategies used to make artistic artefacts in the past with an eye on using these skills to design and fabricate contemporary objects. While the technique of granulation requires long-term repetition to develop proficiency and mastery, the basic skills and insights gathered during the course will prepare the participant to continue in autonomy. David Loepp was born in 1951 and grew up in Wyoming. In 1969 he moved to Paris. 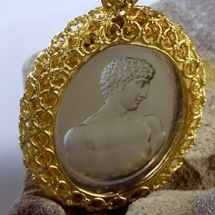 Three years later he moved to Sicily where he apprenticed as a goldsmith and sculpture. 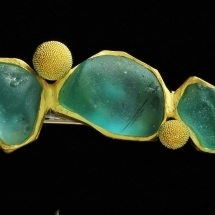 Fascinated by ancient jewellery, he worked primarily with the exponents of “archeo-gioielleria” in Messina and Rome where he opened a workshop in 1996. He has worked in experimental archaeology for the past two decades in collaboration with the University of Rome la Sapienza, Italy’s National Research Council and the Antiquitates Center for Experimental Archaeology in Civitella Cesa. For each course, the school suggests the level of preparation needed to achieve maximum results. Teachers and instructors will not be able to spend extra time with students who do not have the indicated skills level. Advanced: courses suitable only for people in possession of professional requirements or at least three-year studies. Basic knowledge of metallurgy, notably the properties of metals and the preparation of alloys. 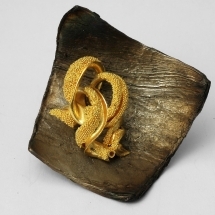 Dance - Brooch - 2006. Gold element in Au 916, granulated 0,4 mm. 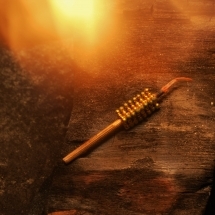 Weight, 6,2 gr (5,6 without granules); gold element dimensions are 24 x 18,5 x 14,2 ht mm. 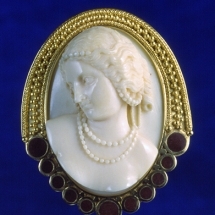 Double pin brooch. 18,3 gr Damascus steel element: 38,4 mm x 39 mm. Bat, Oman structural granulation bead – replication 2016. 96 granules of which 32 are 0,8 mm & 64 are 0,6 mm diameter circa. 6 mm total length, 3 mm square side. 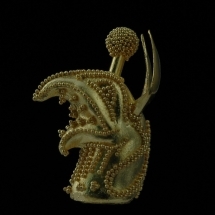 Ebla – 2015 - Replication of a gold disk from Ebla, original dated 1700 BC. Diameter 3 cm. Granulation and decorative wire with lapis lazuli stones. Close-up of flower center 2014 - 0,4 mm granulation. 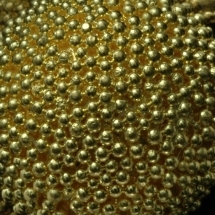 Close-up macro of flower center, granulation on a half-sphere 8,6 mm diameter. Total weight of granulated half-sphere is 1,55 grams. 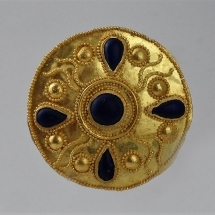 Brooch- medieval glass from Haifa – 2010. Spheres diameter 8 mm and 6 mm; granules 0,5 mm diameter. Length 63,6 mm x 25 mm width. 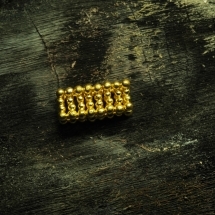 Weight- 30,3 gr total Au 916; 3 gr double brooch pin Au750. 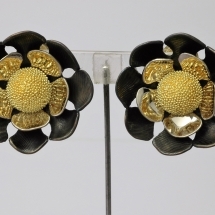 Flower 2014 – 17,35 grams total weight, 28 mm diameter. 2,4 gr Au 916; 9,1 gr Au750; 5,85 gr Damascus steel. Granulation with 0,4 mm granules. Cufflinks 2001 Etched carnelian and agate beads from Mesopotamia II-I millennium BC, swivel-mounted in basket-like openwork . Solid post with granulated lentoid-form backings. Dimensions and weight not available.